How time flies when you are having fun! Last week was such a blur, but I will do my best to be as descriptive as possible. 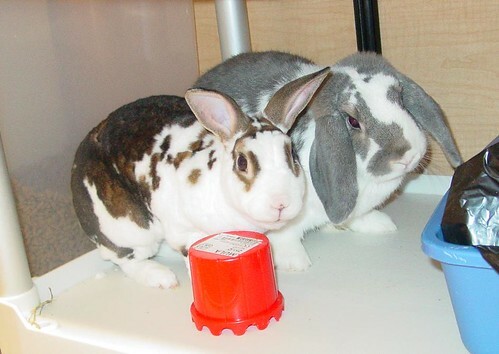 Let me start the week with Tuesday night where I had stopped in to visit Knitters Nook in Johnston before the PetSmart Adoption Center’s bunny session. I had wanted to drop in to visit LYSO Sharon and her husband Mike to check on how they were doing, and this was my chance. 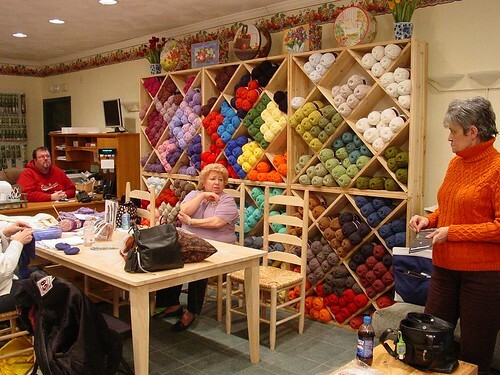 That evening Sharon was there with her mother and a couple of other knitters. One great item about this place is that the shop is open until 8PM from Tuesday to Friday. They have the latest Berroco, Debbie Bliss, and other KFI brand yarns in stock. The sectional is comfortable and the long pine dining table has inviting chairs that beg you to sit and knit. I did some work on my test sock and then bought some much needed bamboo circular needles. 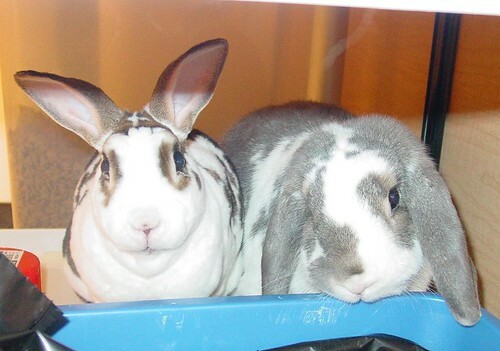 There were a couple of new bunnies at PetSmart. 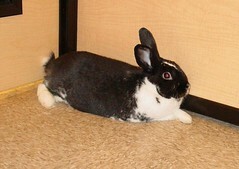 Gabby is practically a negative image of my mischievous Julius, and she is such a sweet girl. Cricket is one squirrelly guy who gave me a hard time when I attempted to trim his nails. Meanwhile, the hilarious comedic duo of Nudges and Paddy romped about the cages area while I was taking care of the other two. They were teasing the lone kitten who so wanted attention. Such crazy bunnies I played with! Wednesday was to be my sole night of staying home and knitting. 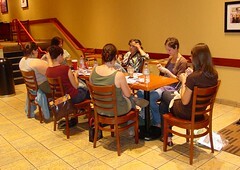 Instead I played on Ravelry and did some behind-the-scenes work in the groups and yarns. I always find myself getting wrapped up in my work and not realizing the time that should be spent elsewhere. 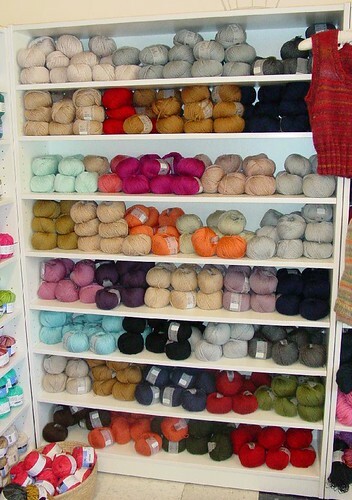 My husband constantly says I am obsessed and addicted. I guess there could be worse habits to be involved in. 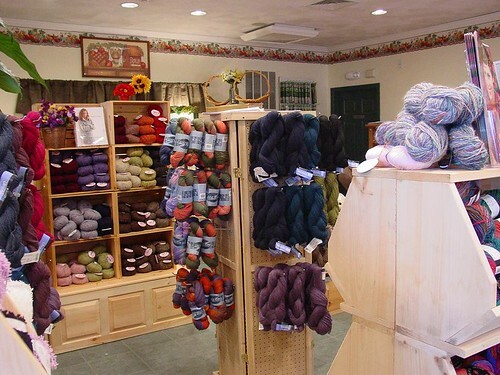 After work on Thursday, I dropped by Yarns at Lacewings in Warwick, RI. LYSO Mary was there working on the latest newsletter and had just sent it out while I was there. 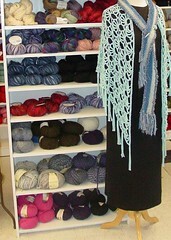 The shop looks fabulous with its reading corner to sort through patterns and yarn, and the group table is cozy as ever. 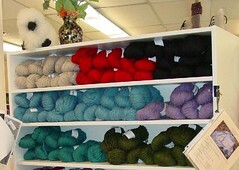 The new shipment of Harrisville’s bulky yarns were unpacked and are under the store’s sheep mascot. 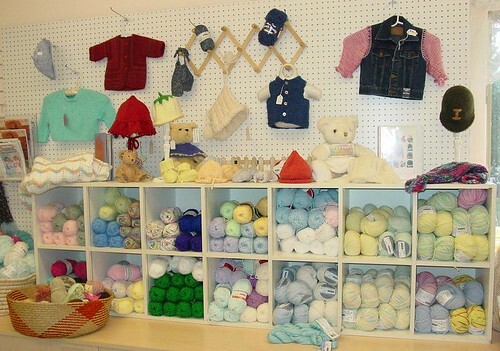 I really like how the baby section was moved and displayed. 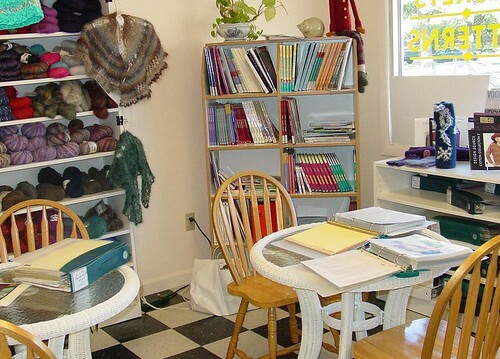 The possible FOs to make definitely bring in bright cheeriness to the space. 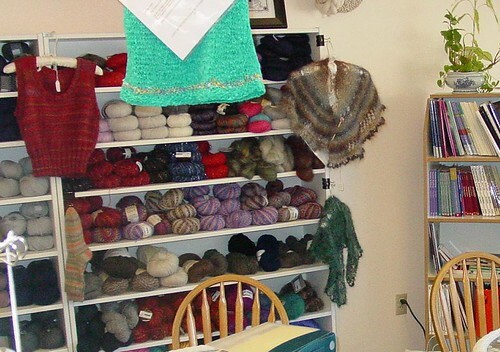 Feel free to sign up for the e-mailed newsletter, or bookmark Mary’s blog to find out the latest classes and sales. It’s nice to have a preview of what we’ll be seeing when the guild meets at Lace Wings next week! Heheheheh…my husband says the same thing about me!! 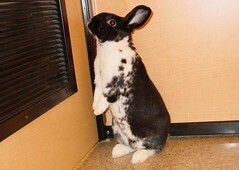 I Love the bunny pictures, especially the one of the inquisitive fellow standing up and checking out the view. 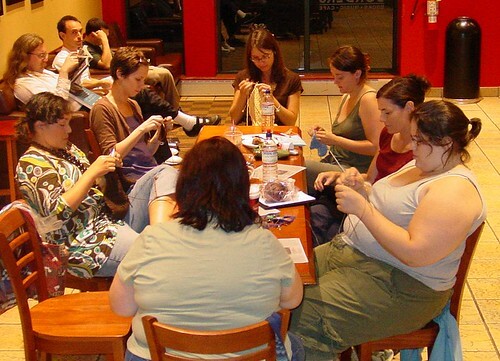 The gathering looks like fun and the LYS is amazing. Where are you? did you get up and take the picture? What a busy week! 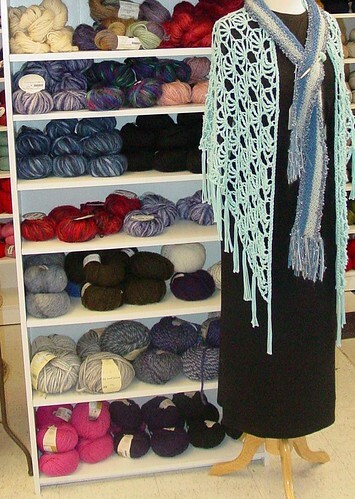 Lacewings looks like such a fabulous store. I wish we had something like that here. A reading nook! I have heard my husband utter those words more than a few times. The bunny’s are so cute! 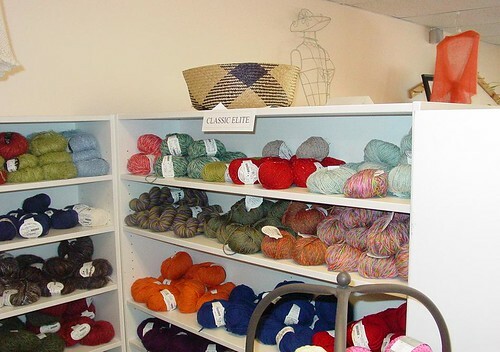 You live near some great yarn shops! 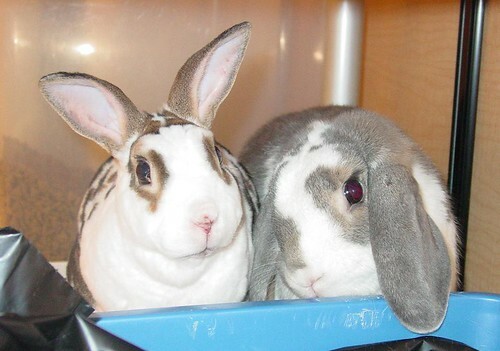 Oh the bunnies are so cute! I’ve been planning a new condo for Gretchen, but I think I will have to wait until my cast is off to build it.